Turning Pointe Dance Centre is proud to emphasize dance as both a beautiful art form and one of the strongest disciplines that applies to all aspects of one’s life. With any form of dance, one learns to incorporate both the mind and body, creating a balanced individual who exhibits both positive self-esteem and precise technique. We strive to guide our students toward discovering their own personal love of dance, whether they pursue dance for a hobby, a college dance program or a professional career in the dance industry. We are also the home of Trilogy Dance Company, a nonprofit performance group founded in 2002. Members have the opportunity to attend dance conventions from all over the country and train with professional choreographers and dancers from Los Angeles to New York. They perform and compete at venues in the Pacific Northwest and across the country each year. Several former Trilogy members have gone on to pursue dance careers. Fall Session Registration Now Open! Founded in 2002, Trilogy Dance Company is the nonprofit performance group affiliated with Turning Pointe Dance Centre. Members have the opportunity to attend dance conventions from all over the country to train with professional choreographers and dancers from Los Angeles to New York. They perform and compete at venues in the Pacific Northwest and across the country each year. Several former Trilogy members have gone on to pursue dance careers. 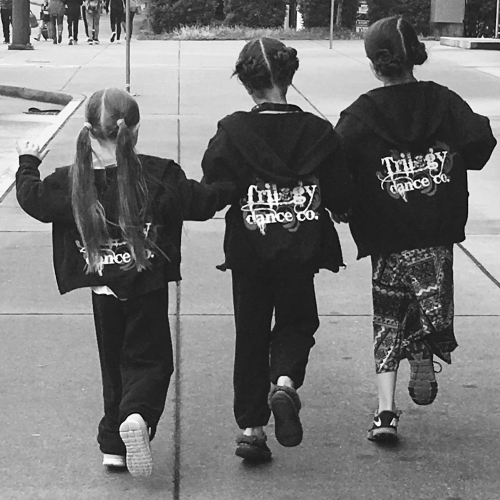 Trilogy members range in age from 6 to 18 years old in four age divisions: Mini, Junior, Teen and Senior. Auditions for member selection are held annually in June for the following school year. Please click on the link below for information regarding next year’s season. Need new dance wear? Get your shopping done online or at our studio with Tilt Dancewear! Click the link below to learn more.